An inhibiting calcium signaling preventing hemorrhagic viruses (in green) from escaping from a host cell, stopping their spread. Credit: University of Pennsylvania, adapted. The goal of some anti-viral therapies, therefore, is to buy more time and give the immune system a leg up on the virus. A new study led by Bruce Freedman and Ronald Harty in the Department of Pathobiology of the University of Pennsylvania School of Veterinary Medicine demonstrates a way to do that, by reducing the ability of the virus to exit a host cell and spread. Their work showed that blocking a calcium-signaling pathway could inhibit not only the Ebola virus, but also Marburg, Lassa and Junin viruses, all sources of deadly infections. The research was published in the journal PLOS Pathogens. Freedman and Harty teamed with scientists from Fox Chase Chemical Diversity Center and the United States Army Medical Research Institute of Infectious Disease (USAMRIID) on the study. Calcium signaling is a key regulator of many cell processes, and earlier studies by these authors had suggested that calcium is needed by these and other viruses. The researchers followed up by examining how cellular calcium levels responded when VLPs were being produced in cells. 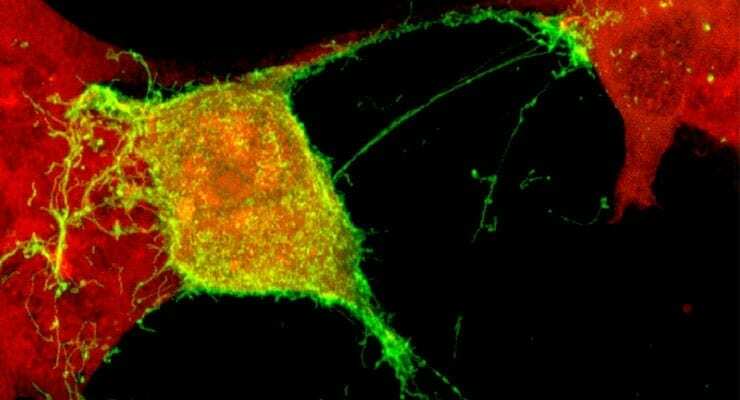 They found that virus matrix proteins triggered significant upticks in calcium levels, which were prevented when the researchers introduced a mutated version of a gene that encodes a calcium channel called ORAI1 into the host cells. The National Institute for Allergy and Infectious Disease (NIAID) and the Defense Threat Reduction Agency (DTRA) supported the study.